Two suffer heat stroke during marathon and evacuated to hospital; eleven more injured during event and treated by MDA teams. 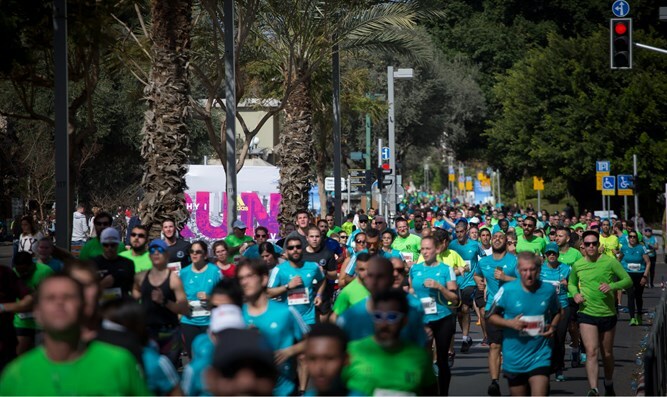 Two people were severely injured after suffering heat stroke during the Tiberias marathon Sunday. In the first incident, a 40-year-old man arrived at the MDA clinic at the marathon's end point and collapsed. The MDA team administered medical treatment and, after stabilizing his pulse, evacuated him to a local hospital in serious condition. MDA paramedic Tair Hazazi said: "The MDA team assigned to the marathon noticed on one of the tracks a 40-year-old man who was feeling ill and in a state of partial consciousness. He was taken to the clinic tent which was set up at the end point. Life-saving medical treatment and advanced resuscitation techniques including medication, respiration, and electric shock were administered until his pulse returned and his condition stabilized, and then we evacuated him to a hospital in an intensive care unit in critical condition." In the second incident, an MDA paramedic spotted a 35-year-old man stumbling around in confusion near the Tzinbari beach and took him to the clinic, where he was evacuated to the hospital in critical condition. Paramedic Shimon Bismuth said, "As part of MDA's preparations for the medical security of the marathon, we deployed with ambulances, mobile intensive care vehicles, and MDA motorbikes along the race route. I saw the runner walking around, confused, and showing signs of heat stroke. I immediately brought him into the intensive care unit and while administering initial treatment I quickly evacuated him to the clinic where we continued the life-saving treatment that included a special ice bath to cool his body. He was put on a respirator and evacuated in serious condition to the hospital." In addition to the two seriously injured, 11 more persons were treated by MDA teams. Two of them, a 35-year-old man and woman suffering from heat stroke, are in moderate condition. The remaining nine are suffering from weakness, exhaustion, and bruised limbs.